It’s no longer about brand-first. It’s about giving consumers content that adds value to their lives, and in return adds value to us. 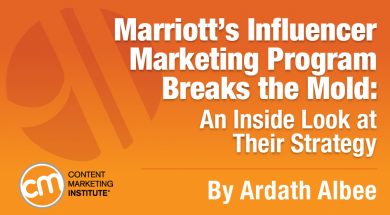 Influencer marketing is a popular strategy for B2C content marketers, but none have approached it with a more solid foundation and open mind than Marriott. In the past, influencer marketing was focused on the appeal well-known celebrities could establish with their endorsements, but this has evolved. To accomplish what David Beebe, vice president of global creative and content marketing for Marriott International, refers to as the “3Cs” strategy (content, community, and commerce), Marriott launched a 65-person content studio. Its charter? To publish, distribute, and share digital content across multiple platforms and on all screens with the intent to build worldwide communities of people passionate about travel that will drive commerce to the company’s hotels. These are some of the reasons why David is a Content Marketer of the Year finalist, chosen in particular for his dedication to influencer marketing. The Content Marketer of the Year will be announced at Content Marketing World this September. While you may not work for a travel company, read on to discover more about how Marriott works with influencers to create engaging content that builds active communities that drive commerce. Anyone who wants to work with influencers can learn from Marriott’s strategy. 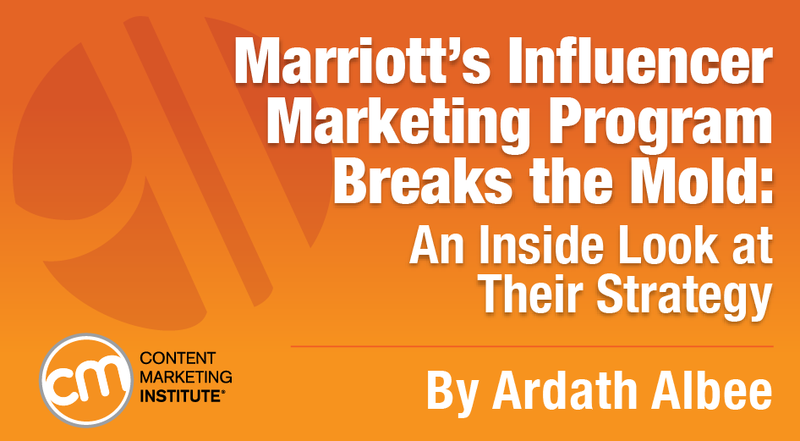 Before we look at some of the unique approaches Marriott has taken to working with influencers, let’s look at what they’re producing across the brand. David has partnered with social media influencers in the production of travel videos, video blogs (vlogs), and short films. “All the content we’re creating – whether it’s destination or utility, travel hacks, or entertainment – is being produced with content creators in the creative community,” says David. One video project is in conjunction with JacksGap, a travel vlog directed by Jack Harries. David signed Harries to an exclusive development deal to produce three short films in locations where Marriott has a presence: New Orleans, Istanbul, and Tokyo. The films have wide audience appeal and are branded by Marriott. They are distributed on Jack Harries’ YouTube channel, which has more than 4 million subscribers. He also writes about his “behind the scenes” experiences on his personal blog. One of our targets is the next-generation traveler, or younger traveler. We’re partnering with storytellers who produce compelling stories and we’re the hero in the story enabling that story to be told. Snapchat is one of the biggest platforms young people use. The program works like this: These hand-picked influencers travel to places with Marriott properties that were chosen by Snapchat users. 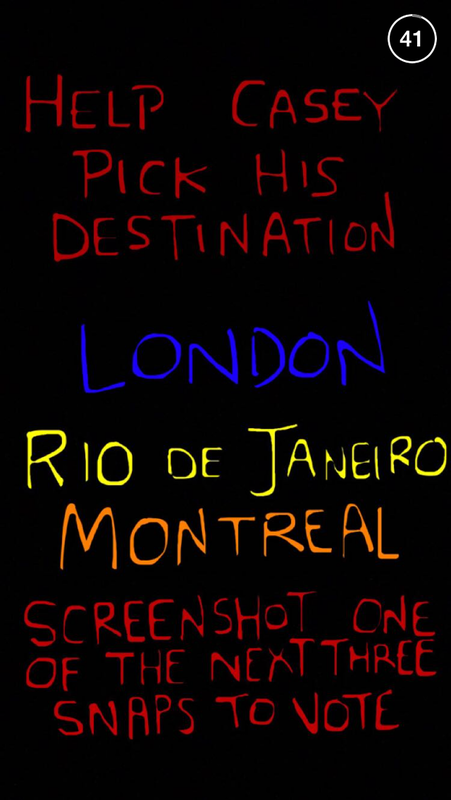 They then document their journeys and share their experiences on both Snapchat and their personal platforms. Whereas Marriott’s interactive stories on Snapchat are intended for a younger audience, its 12-episode series, Year of Surprises, is for Marriott Rewards Members. The program, which celebrated Marriott Rewards’ 30th anniversary, asked that people nominate someone who deserves a special celebration. Marriott received more than 25,000 nominations. Another Marriott program, “Travel Brilliantly,” crowdsources ideas from its customers. 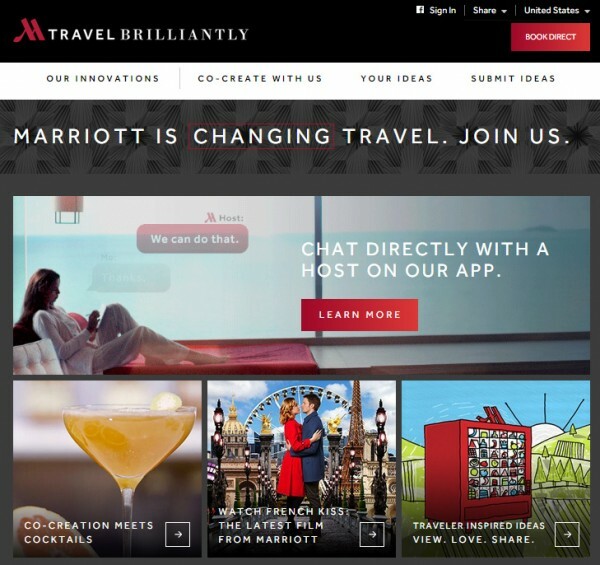 The premise: They want travelers to provide ideas that Marriott can implement to make their stay brilliant. The Navigator Live is a TV series that takes visitors behind the scenes with musicians who perform at Marriott’s Renaissance properties. The musicians also share their favorite spots in the cities in which they are staying. David’s most aggressive projects are the feature films — two thus far — that will have short theatrical runs, as well as being available on all screens, including in Marriott hotel rooms. The first, Two Bellman, has garnered more than 5 million views on YouTube. The latest, French Kiss, is a romance shot in and around Paris. It was developed to remind us that travel should inspire and delight, and it has been viewed more than 6 million times on YouTube since its launch in May 2015. French Kiss will propel our ‘3Cs’ strategy of producing entertaining and informative content that builds communities of people passionate about travel who will drive commerce to our company’s global portfolio of hotels. One of the hardest things to do when outsourcing content development is to give up control and make it simpler for the influencers to produce. Yet by doing so, Marriott’s Content Studio has been able to publish and distribute content that delivers on its charter. Rather than dictating the topic and type of content you want from the influencers, let them come back to you with a concept that plays to their strengths and social credibility. That’s just what David did when he asked Malakai, the founder of Substance Over Hype, to give him an idea for the short film that became Two Bellman. According to David, “Malakai is a passionate storyteller.” The script only went through one round of editorial review with Marriott. The Content Studio validated and trusted their talent, which gave Malakai the freedom of artistic expression. David searches for talent that is influential with Marriott’s large audience followings. Examples include Jack Harries who directs JacksGap, a travel vlog that more closely resembles the efforts of a refined filmmaker. As mentioned above, his YouTube channel has nearly 4 million subscribers, which in turn offers a lot of visibility for Marriott. Other deals include superstars on Snapchat and other YouTubers with successful followings. Make sure the influencers you choose not only have the type of audience you want to cultivate, but also have a knack for creating engaging content. Once you find influencers who are adept at creating content that helps meet your goals, asking them for more of it under an exclusive agreement can be a worthwhile choice. For example, the content that has appeared on JacksGap has been so successful that David executed an agreement with Jack Harries for the production of three short films in countries with a Marriott presence. David’s 3Cs strategy is focused on broad channel distribution, as well as the attention to detail required to create original and unique content for Marriott Rewards Members, its Travel Brilliantly initiative, and the platforms where its influencers have a presence, such as Snapchat. Make sure that the type of content your influencers create will be focused on what each community will find compelling. Marriott’s David Beebe is a finalist for Content Marketer of the Year – and he is also presenting two sessions on Marriott’s Content Studio. To learn more about our Content Marketer of the Year finalists, we’ve put together a new SlideShare, Get Creative: Profile Of Six Content Marketers Of The Year Finalists. In it, you’ll find evidence of what made these marketers stand out.